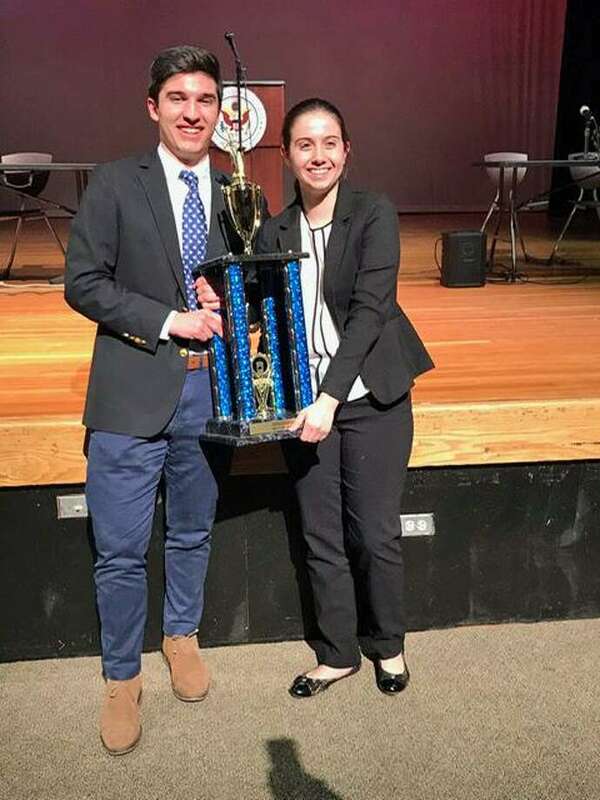 Weston High School seniors Sean O’Neil and Carolyn Zech survived an intense, day-long competition to win the Connecticut Debate State Championship Saturday, March 23, at Joel Barlow High School in Redding. The American Job Center Southwest’s Career Coach returns to Westport Town Hall on April 11. The coach will offer a class in Social Networking for Job Search from 10 a.m. to noon, and from 1 to 3 p.m. This course will focus on the increasing necessity for an online presence to be a credible employment candidate in the current hiring environment. Emphasis is on the most popular social networking sites and how to use the resources and tools of those sites. The Career Coach is a “training center” tour bus equipped with ten wireless computer labs offering free computer classes to residents in the greater Norwalk area. The mobile unit operates on a monthly schedule of visits to various community locations and is accessible to people with disabilities. Area residents interested in registering should contact the Westport Department of Human Services at 203-341-1050 or email humansrv@westportct.gov. For more information, including the current Career Coach schedule, check the website for American Job Center Southwest at www.ajcswct.com. Learn the foundation of fly casting on April 6 from 1 to 2 p.m. in order to enjoy fishing in Connecticut. Weston-based, nationally, renowned fly-casting expert John Field will be offering a beginner’s class on fly casting on Veterans Green, adjacent to Westport Historical Society. Equipment will be provided by the Nutmeg Chapter of Trout Unlimited. This is an ideal class for those who’d like to learn more about this classic American sport. John lives in Weston and is one of only three master casting instructors in Connecticut certified by Fly Fishers International. He has authored two casting books, “ACA’s Beginner’s Guide to Fly Casting” and his advanced book, “Fly-Casting Finesse,” both of which will be available to purchase and author’s signature after the class. Registration is limited to 10 participants at $75 per person. Registration is required. Register online at westporthistory.org or call 203-222-1424, ext. 5. A second class will be offered on April 7 for overflow registrations. In observance of National Child Abuse Prevention month in April, the Westport Police Department and the Human Services Council’s Child Advocacy Center, Children’s Connection, are partnering up to plant a “pinwheel garden” on April 5 at 10 a.m. at police headquarters. For information on how to report suspected child abuse and/or neglect, visit the state of Connecticut Department of Children and Families website, portal.ct.gov/dcf or call 800-842-2288. Larry Silver, a world-famous photographer, will be the guest speaker at the Y’s Women meeting on April 8 at Temple Israel on Coleytown Road in Westport. The meeting will begin at 10:45 a.m. with coffee and conversation, followed by the program at 11:30 a.m.
Silver’s images hang in museums around the world, including New York’s Whitney Museum, Victoria & Albert Museum in London, Johnson Museum of Art at Cornell University, and the Figge Art Museum in Iowa. Recently, Harvard’s prestigious Fogg Museum of Art acquired 20 of his renowned photos. The Westport Weston Chamber of Commerce’s Supper & Soul dinner and concert series continues on April 6 with some New Grass. The single ticket, multifaceted event entitles allows participants to enjoy a three-course meal at one of eight downtown restaurants, then see a concert at the Seabury Center and return to any of the same restaurants for happy hour pricing for drinks. The ticket for this event will be $75 per person. This concert will feature the Colorado-based band, Head for the Hills, whose sound the Denver Post called “a smart mix of alternative influences and a knack for driving down-home rhythm that gets their crowds to ground their heels in,” They have played all around the country and are making a Northeast swing through Connecticut. The eight participating restaurants in this collaboration include: 190 Main, Amis, Rothbard, Spotted Horse, Tavern on Main, Jesup Hall, Matsu Sushi and now Wafu, each within two blocks of the Seabury Center on Church Lane. The concert takes place at the Seabury Center, a 196-year-old adaptively reused former church owned by Christ and Holy Trinity Church. For information and to purchase tickets, visit www.westportwestonchamber.com/supper. The next in the series is being put together for November.